Thank you for visiting the DFW Rocks Social Media “Marketing Goodies” page. First, let me say I appreciate your willingness to spread the word to your online networking about the DFW Rocks Social Media Conference coming up on June 29 & June 30, 2013! I am really excited about the 18 speakers, 17 presentations and two days of social media know-how that will be shared between not only the speakers, but also the 250 conference attendees. Below I am including some tweets, posts, and additional marketing pieces for you to make sharing the word easy. Feel free to use these, tweak to your needs or write your own personal messages. Need a reminder why you want to “Share” the word with your network? EACH person who gets 5 “Who Referred” mentions in ticket sales WINS a private social media consulting session with me. Everyone WINS – all RUNNER-UPS get complimentary access to my pre-recorded webinar “20 Tips for Twitter Success”. Minimum of 10 “WHO REFERRED” mentions in the “I Want More Info” opt-in box on the conference website. Now … It is time to go tweet, share, pin, +1, and email your NETWORK … Don’t forget to include the link, promo codes & request using your name for “WHO REFERRED YOU” when sharing, opting-in and registering. Wow! #DFWRocks2013 – GR8 speaker & prez line-up. http://bit.ly/DFWRocks2013 Use code MYGUEST or MYGUEST1 & Save! Tell ‘em I sent you! 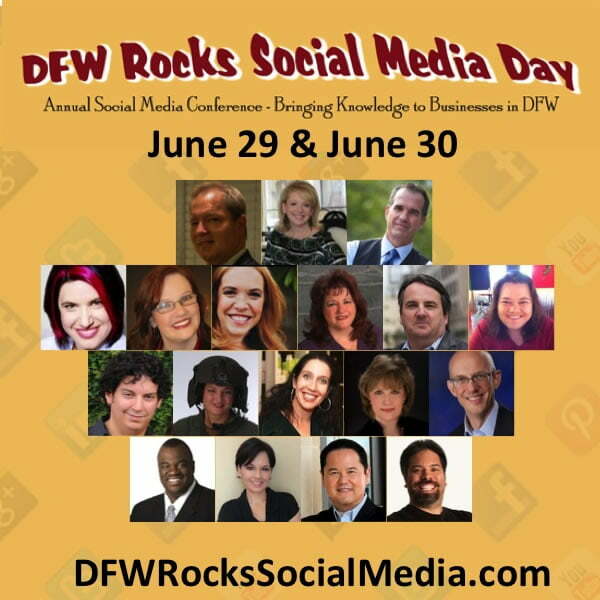 #DFW Rocks Social Media June 29 & 30. Register & Save Use MYGUEST or MYGUEST1 http://bit.ly/DFWRocks2013 Tell ‘em I sent you! Help me WIN! Click this link http://bit.ly/DFWRocks2013 Use code MYGUEST or MYGUEST1 and Save. Tell ‘em I sent you! I’m going to #DFWRocks2013 – R u? http://bit.ly/DFWRocks2013 Use code MYGUEST or MYGUEST1 and Save. Tell ‘em I sent you! Get Social Media Know-How & Have fun http://bit.ly/DFWRocks2013 Use code MYGUEST or MYGUEST1 and Save. Tell ‘em I sent you! Opt-In to Learn More About #DFWRocks2013! Visit http://bit.ly/DFWRocks2013 NOW. Mention me in the “WHO REFERRED” box! Promote a specific SPEAKER tweet: I’m looking 4ward to hearing SPEAKERNAME at #DFWRocks2013 http://bit.ly/DFWRocks2013! Tell ‘em I sent you! Use a photo – right click to DOWNLOAD and select “Save Linked File”. Copy your preferred post from below or write your own. Wow! Check out the DFW Rocks Social Media 2013 speaker lineup. I can’t wait to learn at this conference and mingle with not only the speakers, but YOU. Visit http://bit.ly/DFWRocks2013 to read more – register. Use code MYGUEST or MYGUEST1 and Save when registering. Make sure and tell them my name on the “Who Referred You” question. Register TODAY and we both get FREE access to the webinar “20 Tips to Twitter Success”. I’m attending the DFW Rocks Social Media Conference on June 29 & June 30. Are you? http://bit.ly/DFWRocks2013 Use the code MYGUEST or MYGUEST1 and Save on your ticket! Don’t wait until it is too late. Tell ‘em I sent you in the “Who Referred You” question and we both get FREE access to the webinar “20 Tips to Twitter Success”. DFW Friends – Check out DFW Rocks Social Media – I highly recommend you attend if you are available! http://bit.ly/DFWRocks2013 Use the code MYGUEST or MYGUEST1 and Save on your ticket. Tell ‘em I sent you on the “Who Referred You” question and we both get FREE access to the webinar “20 Tips to Twitter Success”. Help me WIN! Order your ticket TODAY to DFW Rocks Social Media http://bit.ly/DFWRocks2013 and tell ‘em I referred you and we both get FREE access to the webinar “20 Tips to Twitter Success”. I want to attend a FREE webinar “20 Tips to Twitter Success” Register for #DFWRocks2013 http://bit.ly/DFWRocks2013 – tell ‘em I sent you and we both get access. Use code MYGUEST or MYGUEST1 and Save! Promote a specific SPEAKER post: I’m looking forward to hearing SPEAKERNAME at the DFW Rocks Social Media Conference on June 29 & June 30! You should join me! http://bit.ly/DFWRocks2013 Use code MYGUEST or MYGUEST1 and Save. Don’t forget to tell them I sent you and we both get FREE access to the webinar “20 Tips to Twitter Success”. You can order a ticket to attend both days of this conference or Social Media Day ONLY – June 30th. I have been given a chance to get access to a Twitter Webinar – “20 Tips to Twitter Success”, and could WIN a Social Media Consulting Session or perhaps even a FREE ticket to #DFWRocks2013. Check out the conference speakers and presentation line-up. Enter your name and email address in the “I want more info” box on the right. I’ll get access to the Twitter webinar (make sure and include my name in the “WHO REFERRED YOU”), you’ll get a follow-up email from Lissa Duty, the conference organizer with more details on the event and how you could also WIN. If you decide to Register NOW – use the code MYGUEST and Save $25 toward the purchase of a two-day conference ticket or MYGUEST1 and Save $10 on a Social Media Day ONLY ticket. This is important – Enter my name when answering the “Who Referred You” question when ordering your ticket and BOTH OF US automatically get the webinar access, and a chance to WIN the other prizes. This offer expires in just a few days so please – ACT NOW! I appreciate your continued support in my business online and offline. Let me know what I can do for you. Have a different social media site or way of promoting? That is great too. If you need any content from me feel free to email.